Click here for the full tour schedule! It’s two weeks before Triss turns 18, and her world is about to change into the most magical one imaginable as she readies herself to enter The Witch Avenue Order... that is until her mother’s disappearance. Instead of celebrating her transformation, she finds herself spreading rose petals into her mother’s empty grave. When Logan, her best friend from junior high, moves back to town for college, he vows to help her find the answers she so desperately seeks surrounding her mother’s disappearance. As they begin uncovering clues, it becomes apparent that the life of white magic they both grew up loving is not what the majority practices, and their lives are in danger. A coven of witches. Magical mayhem. A cute boy from the past. Sprinkle in some emotional turmoil and a little mystery, and you have yourself a rather amazing and intriguing paranormal read! Triss was supposed to meet her mother at the beach, but when the only things she finds are personal items, she knows something is wrong. Her mother has disappeared without a trace, and she is presumed to be dead by the coven. However, Triss refuses to believe that her mother is gone. She reacquaints herself with Logan, a friendly face from childhood, and they slowly begin to piece together the circumstances surrounding her mother’s disappearance. When some of their discoveries leave them questioning the coven and their magical practices, what started out as a quest to find Triss’s mother becomes something a lot more dangerous and deadly. While the premise of the story was what initially peaked my interest, I found there were many other things to appreciate about this book. The magical aspects of this novel were fascinating, and it’s nice to see what I consider to be a more ‘traditional’ form of magic (such as herbs and other earthly elements) being used. 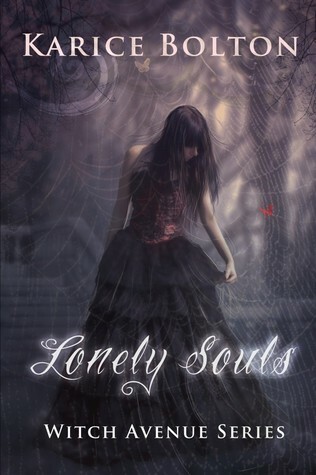 The concept of a lonely soul was also interesting to read about (but I will say no more- no spoilers!). However, this book did suffer a bit from poor pacing. There were a few moments where my attention was easily diverted and I lost interest in the story, but then things would quickly pick up again and I would be unable to stop reading. I think if the pace was a bit smoother and some of those unnecessary/drawn-out moments were removed, this would have been a much more engaging read. Triss, the main character, took a while for me to warm up to. For the first half of the book, she struck me as being withdrawn and slightly abrasive, and I did not find myself really caring for her until the second half of the book. She has to deal with a lot emotionally throughout the story, and while I understand that and did not hold it against her when she was being prickly or rude, it just made it a little harder for me to really get a feel for her character. Logan, on the other hand, I instantly loved. I loved how steadfast his character was and the depth of his feelings for Triss. It is always nice to have a boy who is in your corner supporting you! :) (He has major swoonage potential!) The romance between Triss and Logan was solid, and some of their interactions left me in hysterics and were completely adorable. Overall, this book did have a few problems, but it is a wonderful read all the same. It provides some originality to the YA paranormal genre, and it is definitely an interesting start to a new series. I cannot wait to see what Bolton has for us next!